TOP CHOICE AWARD WINNER FOR BEST TATTOO SHOP 2016! Behold, dearest viewers, the difference in quality money can buy. A common trend we notice amongst the masses are people “shopping” for better prices amongst tattoo artists. While we agree with being financially savvy, we unfortunately feel that “savviness” doesn’t translate well in the tattoo industry. 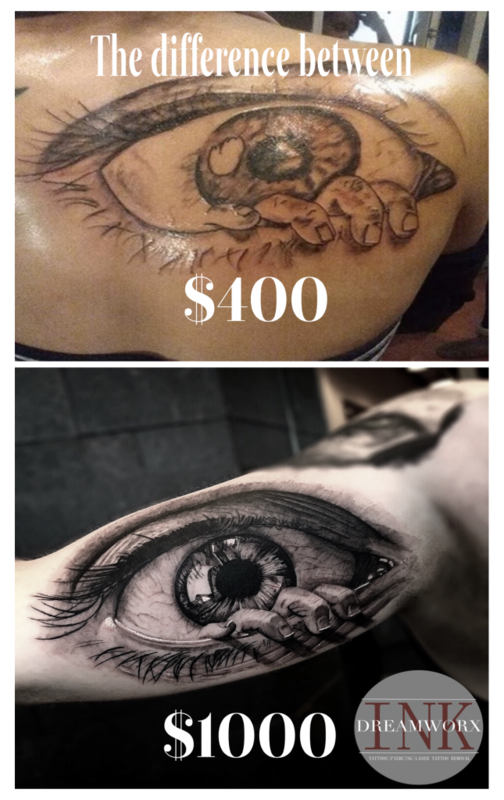 “Good tattoos aren’t cheap, and cheap tattoos aren’t good,” is how the age-old adage goes. May we take this time to remind you that tattoos are permanent, and to be sure your commissioned artists is knowledgeable in the trade, and more-over is specialized in the style of tattoo that you may be looking for. is how the age-old adage goes. May we take this time to remind you that tattoos are permanent, and to be sure your commissioned artists is knowledgeable in the trade, and more-over is specialized in the style of tattoo that you may be looking for.